After a rocky launch back in 2016, Hello Games have been working hard on redeeming No Man’s Sky into the game they initially intended to create. The developers released a two-year anniversary update back in July and have been adding regular new content including community missions and companion features alongside these larger overhauls. With the latest update, this exploration game will give players more to discover within its aquatic environments and upgraded visuals for a more aesthetic experience. 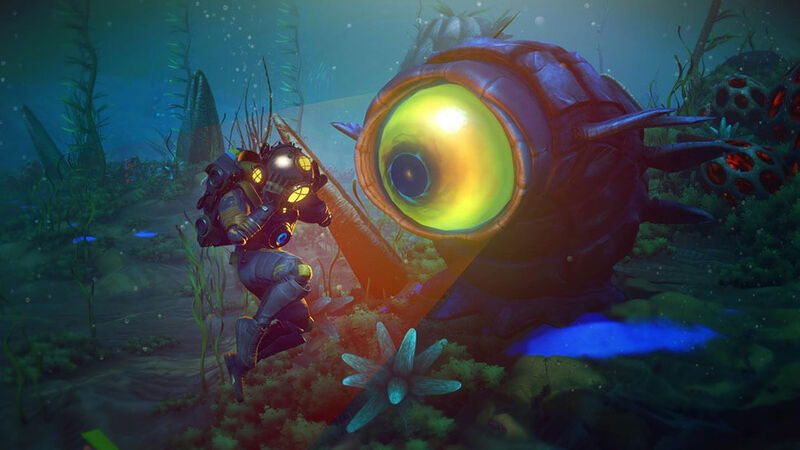 Dubbed The Abyss, players can dive to new depths and encounter curious creatures hiding on the ocean floor. Within this aquatic biome lies an underwater tale that exposes the darker side of No Man’s Sky. The Dreams of the Deep will coerce explorers to discover sunken ruins far below the ocean’s waves where ancient treasure awaits. Scavenge around the sea and you may even come across a rare star ship that has fallen from the skies; repair them and they’ll fly once again. As any scientist would know, the vast expanse of the ocean will require new technology to maximise exploration capabilities. The Abyss update will introduce the Nautilon, an Exocraft custom-made to navigate the watery depths, help you battle any dangerous creatures that cross your path and allow you to mine unique resources. Upgrade the Nautilon to master the unknowns of the ocean and customise your new Exocraft to add a little personality to your adventures. We all know it’s better down where it’s wetter and the Hello Games team seem to agree with the addition of submersible building modules that allow you to build a shelter underwater. These base parts will be integral for deep sea exploration as they provide an escape from the pressure of the surrounding ocean while giving a beautiful view of its depths. The Abyss update is now live and awaiting your exploration. Will you be discovering what lies beneath the surface? Let us know in the comments below!